Rollable rubber keyboard have been around for years but they are still not cableless. This upcoming one with bluetooth is set to steal glances everytime it is used. This new keyboard at the FCC’s web site recently. 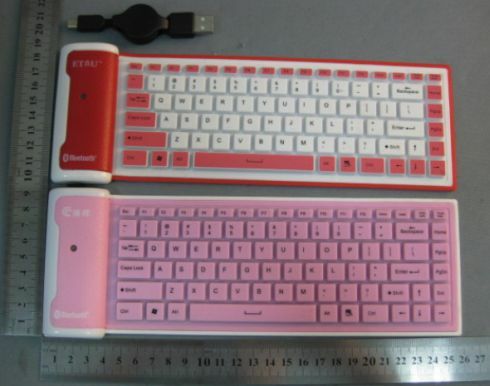 There’s no word on price or a launch date yet, but the rubberized keyboard will be available in red or pink. Thanks to the roll-up design, you can essentially carry a full sized keyboard in your pocket. And because of the Bluetooth support, you’re not limited to using the keyboard with computers that have USB connections. In other words, you should be able to use it with some Bluetooth capable mobile phones. There also seems to be a USB port if you do want to wire up the keyboard for use or to charge the batteries.